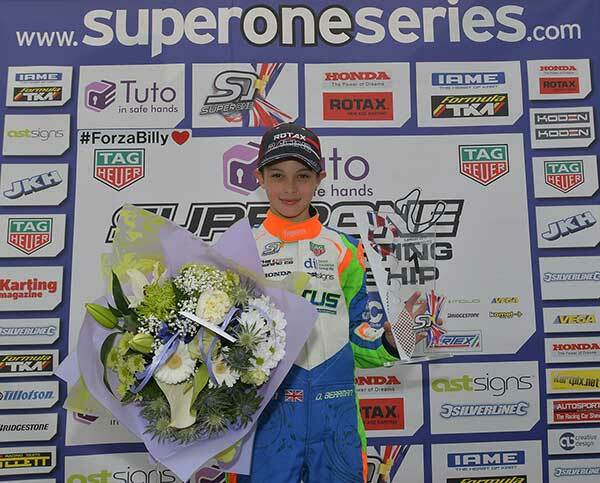 The Super One Series is reaching its climax in Scotland during the summer holidays with most classes only having one more event to go. Practice and Qualifying were wet or drying but the Finals ran on a dry track. Oliver Gray took pole in Timed Qualifying ahead of Arvid Lindblad and held it after the heats, but the big news this weekend is that Taylor Barnard’s winning streak is over after a DNF in the first Final. 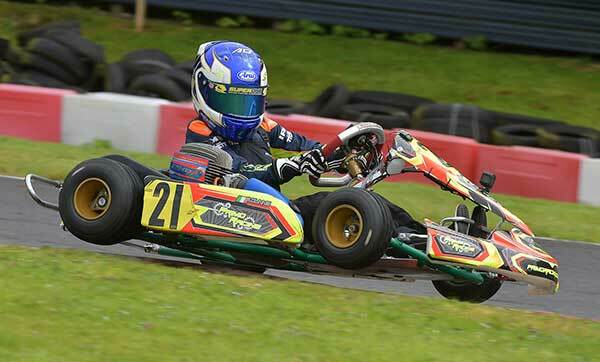 He had a wheel bearing failure in the first heat which put him well down the Intermediate classification. Irishman Alex Dunne took the lead at the start of Final 1 after Gray started on pole, and won 0.45s ahead of Maxwell Dodds who had also been 2nd after the heats. Lindblad took 3rd after defeating Gray a few laps from the end. In Final 2 Dunne again led from start to finish ahead of Dodds while Barnard stormed through the field, gaining 24 places to 3rd. Barnard is 111 points ahead of Dunne going into the next and final round, on 10th September at PF International in Lincolnshire. Oliver Greenall took pole out of the 33 Hondas, just a fraction ahead of Oliver Bearman and Sonny Smith, but it was Bearman who took two heat wins, with the other going to Lucas Ellingham. 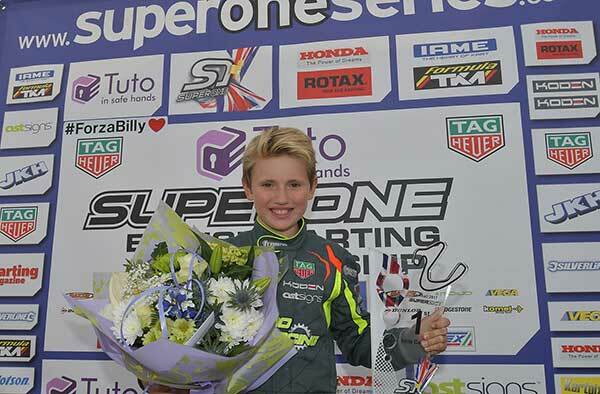 Greenall was 2nd on the Final 1 grid with two 2nds. Alfie Rigby, starting from 5th on the grid, won Final 1 after working his way through the leading group to attack Bearman a few laps from the end. Bearman dropped to 4th but was back to 2nd on the last lap. 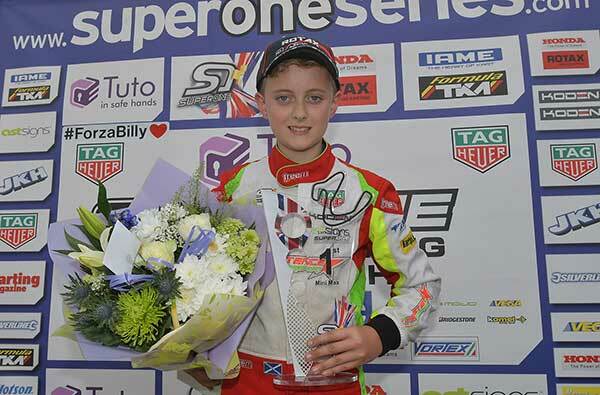 Ellingham finished 3rd but was excluded for driving standards, giving the position to Oliver Stewart. 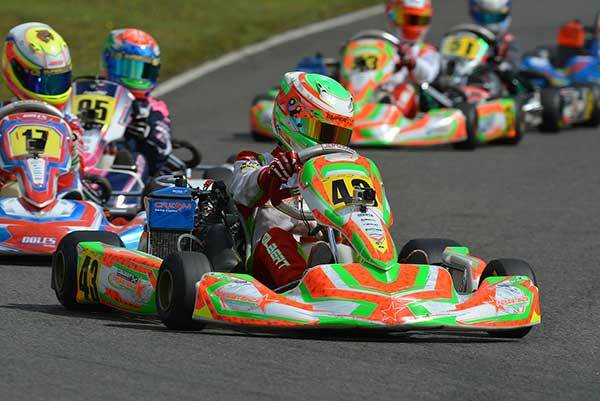 In Final 2 Bearman got his revenge, leading most of the way until he was reeled in and briefly headed by Archie Brown but Bearman regained the lead with Brown dropping to 4th then recovering to 2nd at the flag, with Owen Tolley finishing 3rd for his first national podium. 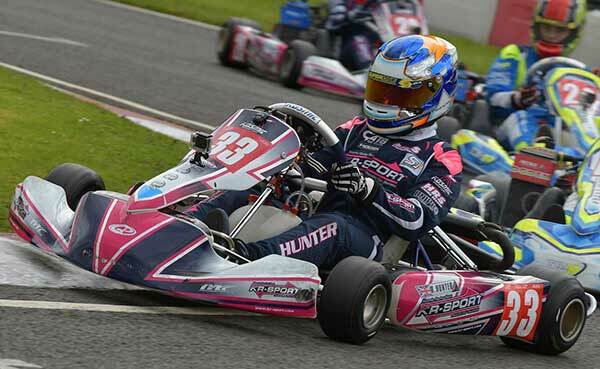 The penultimate round for Honda Cadet is on 26th and 27th August at Shenington in Oxfordshire, with Mclean 37 points ahead of Ellingham. Tom Adams qualified on pole just under a tenth ahead of Lewis Gilbert but Gilbert won both heats with Adams 2nd and 3rd. Gilbert led all the way in Final 1 in a quiet race with Kai Hunter 2nd and Adams 3rd. It was the same story in Final 2 but with Adams and Hunter the other way round. 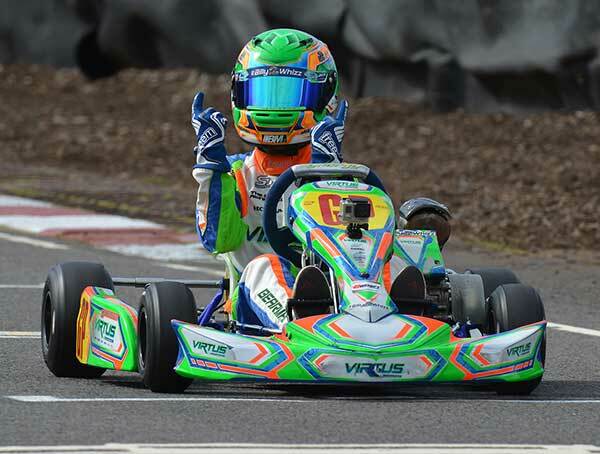 The next and final round for Minimax is on 10th September at PF International in Lincolnshire, where Gilbert will be looking to secure the Championship from Adams. 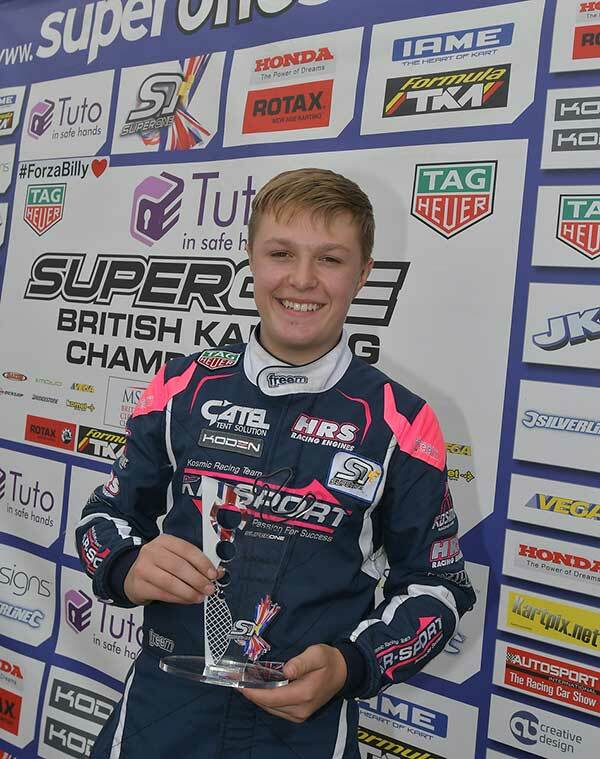 Lewis Gilbert, doing double duty, took pole in Junior Max 0.06s ahead of Rhys Hunter with Clayton Ravenscroft 3rd. Bradley Barrett was on pole for Final 1 though with two 2nds in the heats while Finlay Bunce was 2nd and heat-winner Ravenscroft again 3rd. Hunter won the other heat but was 6th after a less-good result, while Gilbert had two bad results. Hunter won both Finals, the first after coming through then reeling in Ravenscroft, with Barrett taking 3rd. In the second he led throughout the race, pulling away from Bunce who was then passed by Tyler Chesterton. Chesterton still leads the Championship, 63 points ahead of Barrett, going into the next and final round on 10th September at PF International in Lincolnshire.